Music. Dance. Drama. Art. You. Masters Degree in Physical Education from the Polytechnic University of Madrid. Classical and Contemporary Dance in London, Barcelona and Madrid. Carmen Werner formed her company and has been creating since 1987 stage works (small and big format including an opera-dance), street performances, video-dances, a short, collaborations with other companies, special choreography for different Festivals, dance classes and workshops. Prize of Culture (in Dance) by Community of Madrid 2000. 3rd Prize for the 1st Onassis International Competition for Original Choreography with the work “El tiempo de un instante”, 2001. Honorable Mention 2001 - XIII Festival of Cinema in Girona for the video in cinema format “La noche, marejada de un cuerpo”. Born in 1961 he studied business management, music, harmony and composition. Soon after he become part of Carmen Werner´s company where he had developed all his academic and artistic formation. 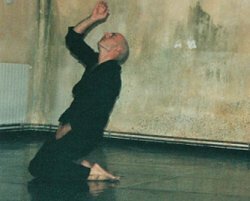 His performing work started in 1993, he had over his shoulders six full length production, three street productions and a dance-video. Nowadays he´s still working at provisional danza as a manager and dancer/choreographer. I always thought that he loved me. even if I was getting naked in front of you, you didn’t see me even when I was wearing your clothes down in the street. Getting deep inside the human being to handle and transform any situation. Trying to communicate by means of dance all the good and evil that we kept inside. • What is The Other Festival?